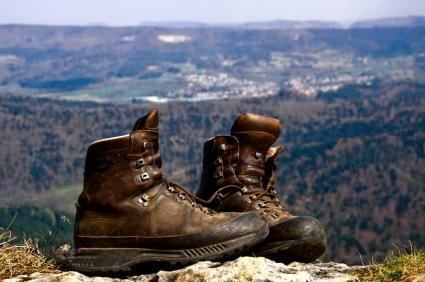 If you can afford them, custom hiking boots are the best way to ensure comfort when you are hiking and backpacking. They can be fitted to your individual foot, created for your individual needs, and specifically designed for the terrain you will be hiking in. The first thing to decide when choosing custom boots is what your needs are. These will depend on the shape of your foot, your size, and where you will be doing most of your hiking. Hiking in the wilderness of Maine will require a different boot than if you are often mountaineering. Will you want a boot or a shoe? Will you need a smooth sole or treads? Will you need special arch support? Are there any usual structures or issues with your feet? The bottom of the boot is shaped exactly to the bottom of your foot. Most people have slightly different sized feet. Custom made boots will be fitted to each foot individually. The shape of the boot will in every way match the shape of the foot that it was created for. Different companies make their boots in different ways, but generally the steps are similar. Numerous measurements are taken of the foot. Pictures may be taken of the foot, especially if there is an unusually high arch or structure. Your height and weight will be noted. You will be asked to make choices about the height of the boot, the type of leather, and the sole of the boot based on your needs and preferences. A last or form will be made that mimics the measurements of your foot. Boots will be created to fit the last. Once you have your boots, they will last you a lifetime if you take good care of them, unless you are a guide or wear them an unusual amount of time. Here are some guidelines for keeping them looking, and feeling, new. Keep them out of direct sunlight when they are not being worn. Condition the leather inside and out on a regular basis. Your boot-maker can tell you how often this should be done. Have the sole replaced as needed, about every five years. Dry them gently if they get wet. Do not dry them near radiant heat. Excess perspiration will breakdown the proteins in the leather so be sure to wear absorbent socks and dry the boots. Washing them out with a baking soda solution once in a while will help neutralize the uric acids present in perspiration. Limmer Custom Boots are some of the most popular and highly respected boots available. People wait for up to two years for their boots when they order from this company. The boots are painstakingly made by hand with numerous measurements taken into consideration. Van Gorkam custom boots are also highly regarded. It can take a year or more for your boots to be completed. Esatto Custom Footwear creates great custom boots in about three months and if you are really in a hurry they can do it in two weeks! Esatto uses old craftsmanship skills to make boots that last years and years. With their hand made custom boots, you can get the quality and the comfort you've always dreamed of. Russell Moccasin creates custom boots with a variety of options including a material that protects from snake bite. Whether you can afford custom hiking boots or are just dreaming of them, it is important to get the best quality boots that you can afford. Hiking gear can be expensive, but good quality can mean the difference between an adventure and a test of your endurance.